Located at the South edge of our incorporated city limits (905 South Main), Horseshoe Pond was originally constructed in the 1930’s by the Izaak Walton League. The City of Maquoketa acquired the property in 1985. The 11.2 acre park has a 2 acre pond, a 40-50 foot bluff that goes through the middle of the property in a North-South direction and has Prairie Creek running through the Eastern boundary. 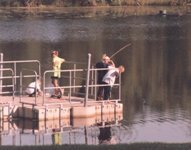 In 1989, a deeper dredging of the pond was completed making it twelve feet deep. The campground has 22 electrical sites and 5 primitive sites. 3 of the electrical sites are pull thru sites. Each electrical site in the main campground has two 50 amp breakers, one 30 amp breaker and one 20 amp breaker. The four sites by the pond have one 30 amp and one 20 amp breaker. There is no water or sewer to the camp sites, but we do offer a sanitary dump station, non-potable and potable water. Sites are on a first come, first serve basis and registration is a self registration process. The rates for an electrical site are $12/day or $70/week. Primitive sites are $5/day and two tents are allowed per site. Reservations can be made one year to date ahead of time for $25.00 at Maquoketa City Hall. If the shelters are not reserved, they may be used on a first come, first serve basis.